It began with a tip to the CIA eight months ago about a possible Osama bin Laden hiding place, and led Sunday to the bold military operation that will go down in U.S. history, as Navy SEALs killed the Al Qaeda leader in a mansion in Abbottabad, Pakistan while he reportedly used women as human shields. And the trail that ultimately led U.S. forces to Bin Laden may have begun with another 9/11 plotter who is now in U.S. custody, Khalid Sheikh Muhammad. Khalid Sheikh Muhammad, central to both the 9/11 plot and the murder of American journalist Daniel Pearl, was captured by U.S. forces and taken to Guantanamo. In 2007, U.S. officials who were interrogating Guantanamo detainees finally learned the real name of a former Khalid Sheikh Muhammad protégé who had become an important confidante of Abu Faraj al Libi. Al Libi was captured in 2005 and also taken to Guantanamo. Guantanamo detainees identified the courier who had worked with both KSM and Al Libi as someone who was probably trusted by Bin Laden. Al Libi had actually lived in Abbottabad in 2003, according to his detainee file. In 2007, U.S. officials learned the courier's real name. In 2009, they located his region of operation and began tracking him. Osama Bin Laden wasn't hiding in a cave, but in a Pakistani city of 90,000 called Abbottabad, just north of the Pakistani capital. In August 2010, through tracking the courier, they found that Osama Bin Laden probably wasn't hiding in a cave, but in a huge house in the Pakistani city of Abbottabad, just north of the Pakistani capital of Islamabad. The acre-large, million-dollar compound had 12 to 18-foot walls, was eight times the size of other homes in the area and just off a major highway, but had no phones. President Obama gave the order for a small team of U.S. Navy SEALs in Afghanistan to go in Sunday night Pakistan time, even though bin Laden had never once actually been seen in the compound. "I determined that we had enough intelligence to take action," said President Obama in a nationally televised address Sunday night, "and authorized an operation to get Osama bin Laden and bring him to justice." Bin Laden, who had been pictured over the years firing an automatic weapon, and his son and three others opened fire on the U.S. raiders. Said President Obama, "After a firefight, they killed Osama Bin Laden and took custody of his body." Pentagon officials said that one way the SEALs were sure it was Osama Bin Laden was that his wife identified him by name. None of the Americans was injured in the raid. The U.S. team was on the ground for only 40 minutes, much of the time spent scrubbing the compound for information about al Qaeda and its future plans. Remarkably, Bin Laden was hiding almost under the nose of the Pakistani military, which has a major garrison in Abbottabad and the Pakistani version of West Point. U.S. officials say Pakistan was not informed in advance of the military operation inside their borders. Bin Laden had long been said to be in the mountainous region along the Afghanistan, Pakistan border, hiding in a cave as the U.S. sought to kill him with drone strikes from above. Instead, he was in a house with many peculiar features that brought it to the attention of U.S. authorities. After locating the Al Qaeda courier in 2009 and then tracking him to the structure in 2010, the CIA noted that the house had high exterior walls topped with barbed wire, high windows and few points of access. Residents burned their trash instead of putting it out. Built in 2005, the compound also had a seven-foot-high wall on a third-floor terrace. U.S. officials wondered if the extra wall was meant to allow a tall man -- Bin Laden's height was estimated at between 6'4" and 6'6" -- to go outside without being seen. The CIA began to believe that a high-value target was in the house. A CIA "red team" assigned to assess the house decided that it could well be sheltering Bin Laden, even though he'd never been seen in the compound. The house looked like it was "custom-built to hide someone of significance," said an official. But the Americans did not share their information about who might be inside the compound with the Pakistanis, said Pentagon officials. The CIA was responsible for "finding" and "fixing" the target, said a U.S. official, and the military "finished" the job. According to U.S. officials, the Navy's SEALS Team Six practiced the assault in a replica of the compound built inside the United States. Late Sunday night local time, two U.S. helicopters from Joint Special Operations Command (JSOC) and carrying Team Six SEALs flew in low from Afghanistan and swept into the compound. As CIA director Leon Panetta listened in, the Navy SEALs stormed the compound and engaged Bin Laden and his men in a firefight, killing Bin Laden and all those with him. Two Bin Laden couriers were killed, as was Osama Bin Laden's son Khalid and a woman. U.S. officials said Bin Laden and the other men used the three women in the compound as human shields, and the woman who died was shielding Bin Laden. The other two women were injured. Children were present in the compound but were not harmed. U.S. officials said that Bin Laden himself fired his weapon during the fight, and that he was asked to surrender but did not. He was shot in the head and then shot again to make sure he was dead. The raid began on the smaller of two buildings in the compound, where the couriers were believed to live. The raid then moved to the larger three-story building. One of the U.S. Blackhawk helicopters was damaged but not destroyed during the operation, and U.S. forces elected to destroy it themselves with explosives. The Americans took Bin Laden's body into custody after the firefight, taking it back to Afghanistan by helicopter, and confirmed his identity. His DNA matched DNA taken from mulitple relatives of Bin Laden with almost 100 percent certainty. A U.S. official said Bin Laden was later buried at sea in accordance with Islamic practice at 2 a.m. Washington time. 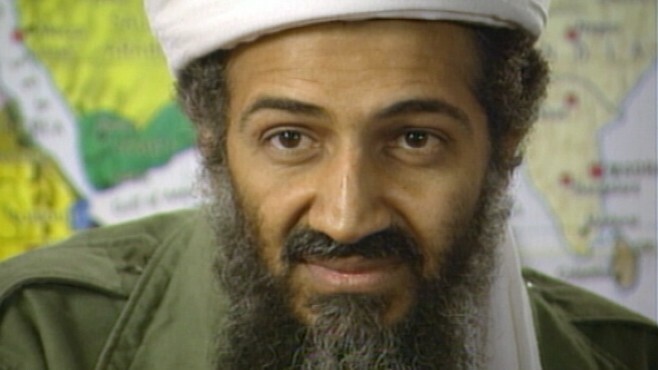 Bin Laden's body was taken to the U.S.S. Carl Vinson, a U.S. aircraft carrier in the North Arabian Sea, according to officials. His body was washed and wrapped in the prescribed way. A military officer read religious remarks that were translated by a native Arabic speaker before Bin Laden's remains were sent into the deep. The original plan had called for the SEALs to rappel down into the compound, but because one of the choppers had a problem it had to do a soft crash landing. According to Pakistani officials, the operation was a joint U.S.-Pakistani operation, but U.S. officials said only U.S. personnel were involved in the raid. U.S. officials say that Pakistani fighter jets were scrambled to intercept the choppers, but didn't reach them. The U.S. team was back inside Afghanistan before 6 p.m Washington time. Abbottabad is a city of 90,000 in the Orash Valley, north of Islamabad, the Pakistani capital, and east of Peshawar. It is 90 miles by road from Islamabad and 40 miles by air. Jake Tapper and Luis Martinez contributed to this report.